A 61-year-old woman awoke to four men breaking into her home in Elyria early Wednesday morning, police tell newsnet.com. Elyria Police said the woman was asleep with her dog at her home on 18th Street at about 3 a.m. when she heard loud noises. 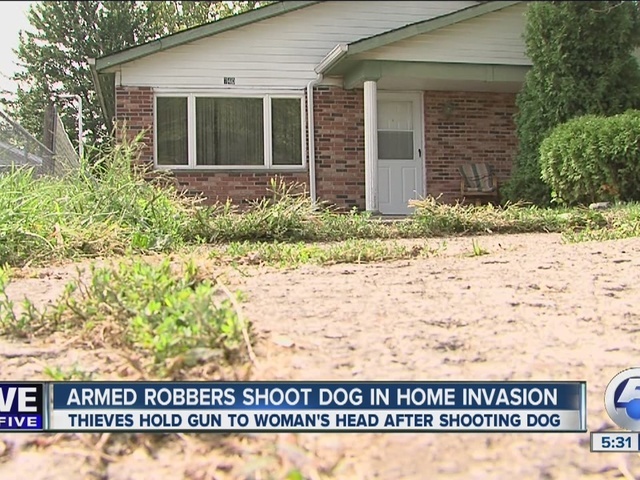 The four men breaking into the home were confronted by her dog who was shot within seconds. "A black male about 6' 1'' wearing a mask and a hooded sweatshirt with the hood over his head pointed a gun to her forehead and ordered her to the ground. She stated that she heard some voices. Some of these individuals were saying 'Elyria Police, get down on the ground.' She stated that she was able to look up and came to the quick conclusion that these were not the police," Elyria Police Captain Chris Constantino said. The victim, whose husband was not home at the time, told police three of the men were armed, and she believes the other man was not armed. "They were asking her where the money was at. She stated that there was no money in the house. They made comments to her that if she didn't comply with their requests that they would hurt her," Constantino said. "As they were leaving they said that if she were to contact the police they would come back and hurt her." If you have any information about the robbery or the suspects, you are urged to contact the Elyria Police (440) 323-3302.